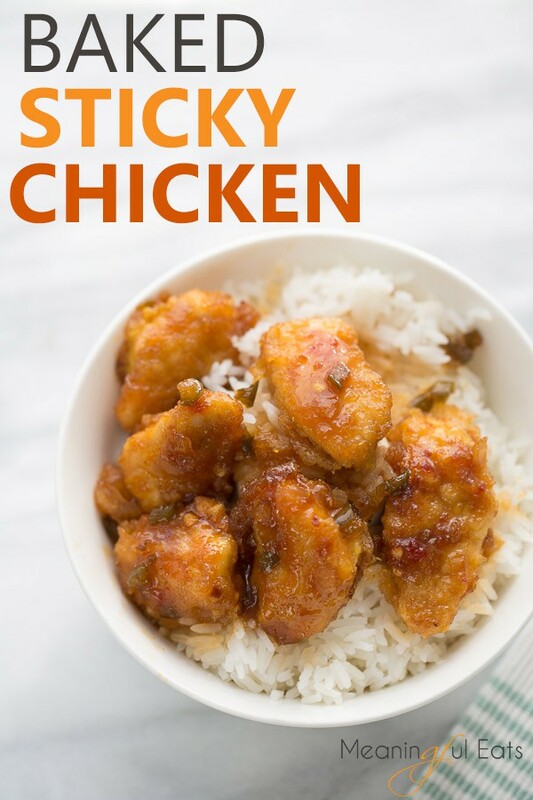 Sticky chicken! Tender chunks of chicken baked in a sweet and tangy pineapple glaze. A crowd-pleasing, kid-friendly favorite that is perfect for any occasion! 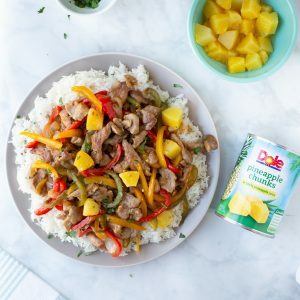 This post was created in partnership with Dole Packaged Foods. Happy New Year! I hope you all had wonderful and delicious holidays. We had a relaxing, staycation Christmas which was just what we needed after a busy year of moving and having a new baby. January is always a great time to start fresh and get back into good routines – whether that be with exercise, school schedules or meal planning. Meal planning is something that makes my life so much easier! When I start the day knowing what we will have for dinner that night it makes the busy evening hours of the day run so much smoother. Meal planning is also so important when you’re following a gluten-free diet. Something I started doing a few months ago to help with meal planning was to make a big list in a Google document of family favorite meals I know my family will always like. We like to try a lot of new recipes, but when I’m in a rut I pull up the list and fill in my meal plan with some tried-and-true recipes. This Baked Sticky Chicken has been on that list from the start. My Mom got this recipe from a friend at church years ago it’s something we all make often. 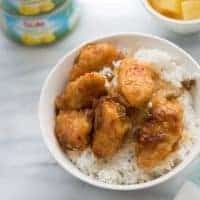 It’s a crowd-pleasing dish of tender chunks of chicken baked in a sweet and tangy pineapple glaze. It makes for a crowd-pleasing, kid-friendly favorite that is perfect for any occasion! 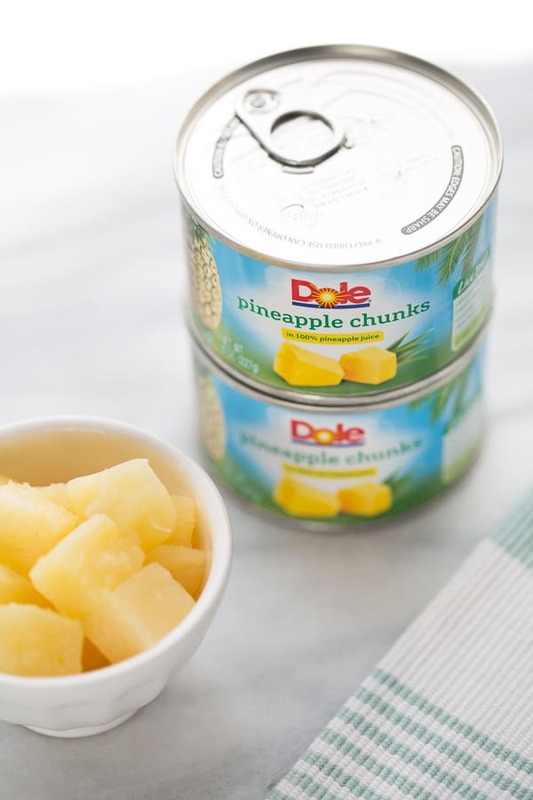 I like to use the juice from a can of Dole Pineapple Chunks for the sauce. Then I serve the pineapple chunks right alongside with the chicken. The chicken is pan cooked in a cornstarch/egg mixture then coated in the sauce and baked. Each piece of chicken is covered in the sticky, delicious sauce. If you’re a new to a gluten-free diet this New Year, meal planning can be your best friend. 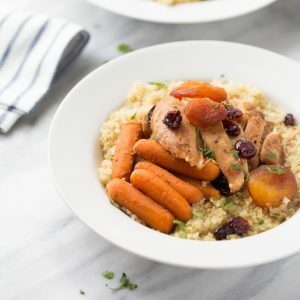 Try making a list of naturally gluten-free dinners your family already likes and meal plan from there. This recipe is simply made with tamari instead of gluten-containing soy sauce. 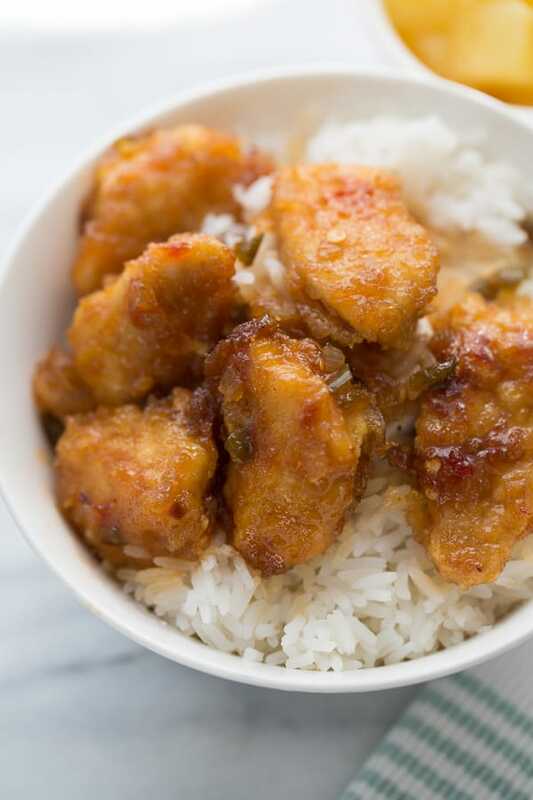 Add Sticky Chicken to your dinner line-up and it will be sure to make the family favorites list! 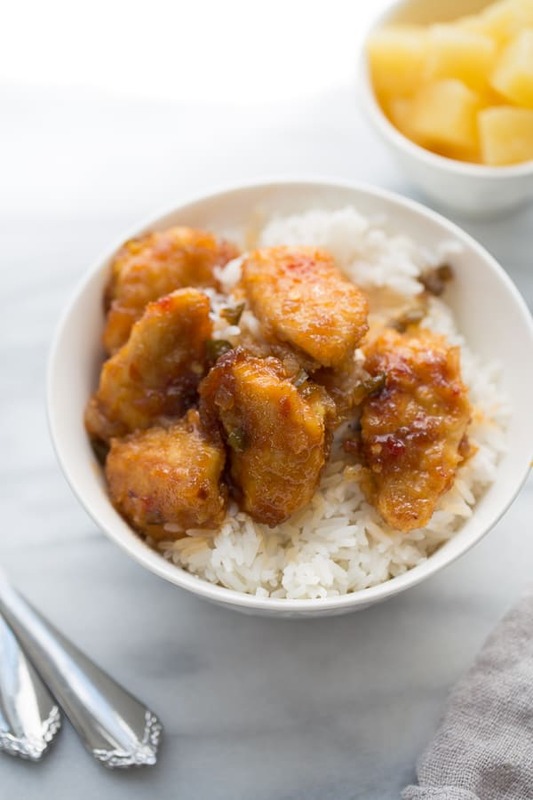 Sticky chicken is a crowd-pleasing, kid-friendly favorite that is perfect for any occasion! I like to use a natural ketchup that is sweetened with cane sugar in this recipe. Preheat the oven to 350F. In a glass measuring cup, mix together the ingredients for the sauce. Add the onion and green pepper to the now empty skillet. Cook until softened, about 3-5 minutes. Sprinkle over top the chicken. Pour the sauce over the chicken. Bake for 30-35 minutes, until chicken is cooked through and sauce is bubbly. 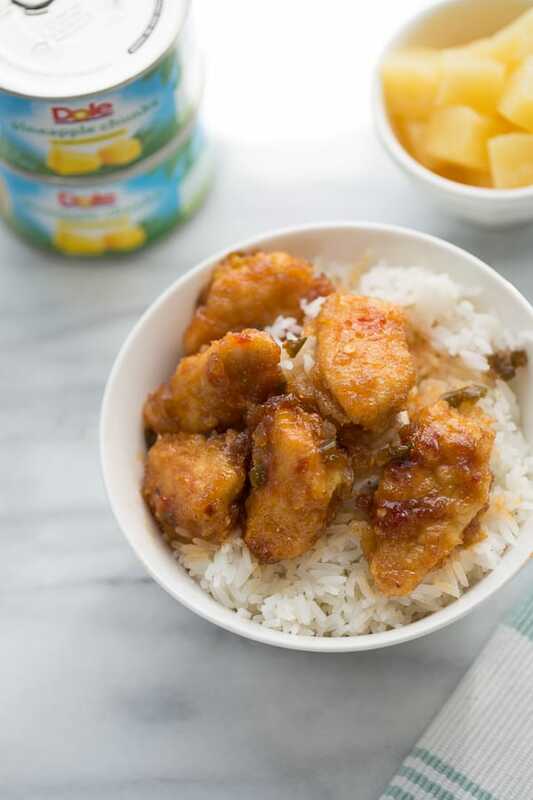 Serve over steamed rice with Dole Pineapple Chunks. Enjoy! This one is soooooooooo good!!! Would it work with another starch instead of corn? Arrowroot or tapioca? 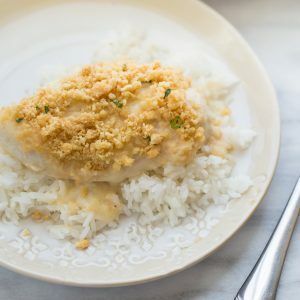 I’ve made this for dinner a few times now and it’s a HIT! Even my picky 3-year-old had seconds. Thank you! This recipe was spot on! Everything was exactly like in your blog and it came out excellent! Also we added fresh spring onions on top! And i used normal cooking oil but it was just fine also! We love this easy meal. Every time we make it, it’s delicious, easy to make, and flavorful!